Ronald Thomas Locke was born April 4th 1942 in Wakefield, Rhode Island. 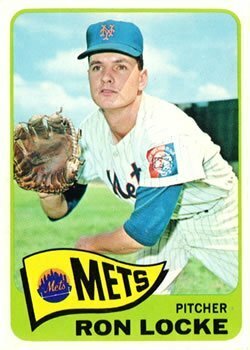 The five foot eleven left hander was signed by the New York Mets in 1963. He impressed right away going 18-8 with a 2.94 ERA in the New York Penn. League at Auburn. The Mets were desperate for pitching and brought him up to the big league club the next season. Locke debuted in the sixth game of the 1964 season, finishing off a 5-1 loss to the Chicago Cubs at the new Shea Stadium. Four days later he was credited with a hold in a 3-2 Mets win over the Pirates in Pittsburgh. He would gain another hold, then on May 20th earned his first career start. He went six innings, in Los Angeles taking a 4-1 loss to the Dodgers. At the end of June he was send down to AAA Buffalo going 3-3 returning to the Mets staff at the start of August. Upon his return, he got a start at Shea in the second game of a double header, against the Houston Astros on August 2nd. He allowed just two runs & five hits over seven innings, beating Don Larsen, earning the only win of his brief career. That day Mets short stop Charley Smith led the charge with three hits, including a solo HR & two RBIs. On the year Locke went 1-2 in 25 appearances posting a 3.48 ERA, striking out 17 batters while his control was off, walking 22. 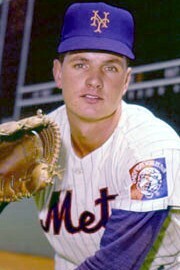 Locke never got back to the majors, but pitched in the Mets organization through the 1970 season in the minor leagues.